Super Hero Boy: My favorite type of super hero! My favorite type of super hero! One of our favorite children's companies has a brand new line of plush which will inspire any little super hero lover in your family. Ze Super Zeros have to be the cutest super heroes we have ever seen! A zebra, monkey, hippo and mouse make up only a small portion of the Ze Super Zero collection. Each are made from an interesting combo of colors and materials that make them really unique to look at not to mention irresistible. 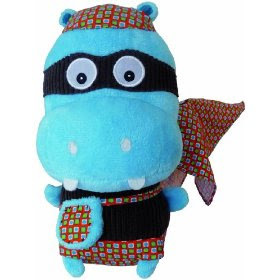 As well each Ze Super Zero has his or her own super power which is really their natural talents, ie the hippo is a fast swimmer and the zebra has camouflage. In a way we all have our own super powers and Ze Super Zeros get that point across in their own way. What we really love about them is the unique look and creative play they inspire. Connor loves to show off his Zipo the Hippo Ze Super Zeros. We absolutely love plush but I have to admit I'm always overly bored by the standard teddy bear or plush dog. Ze Super Zeros give us something unique and fun to enjoy and like everything else we have seen from All New Materials, they are nowhere close to boring! You can check out the Ze Super Zeros over at the All New Materials website and search for a retailer in your area or online. You can also pick up one on Amazon!